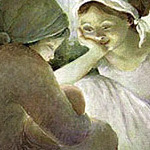 So, I'll embrace my role as destination for breastfeeding-photo seekers and first, give you my tips for you to find your very own images of breastfeeding pictures, photographs, posters, statues, what have you: Type variations of "breastfeeding" and related keywords into Google's image search. There: that will get you a bunch of hits. Wasn't that easy? Just make sure your SafeSearch is OFF! For those of you who wish to view someone else's selections, I now offer you a gallery of some of my favorite nursing artworks. Look on and enjoy. At one point, Picasso didn't mind painting boobies non-cubistically, and in use. 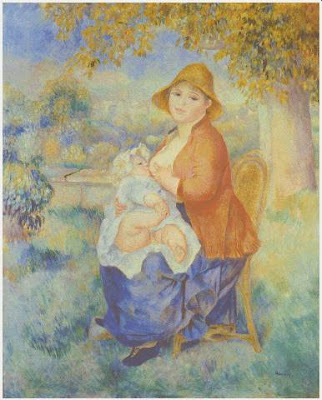 I love how delightfully chubby Renoir's baby is. Reminds me of someone I know (ahem, 31 pounds, ahem...). I don't know who the artist is here, but I found it on a doula website and think it's gorgeous. I love the glow, and the happiness of the friend watching. This one by Charles Moffat shows a modern NIP experience, in an elevator. Nice one. 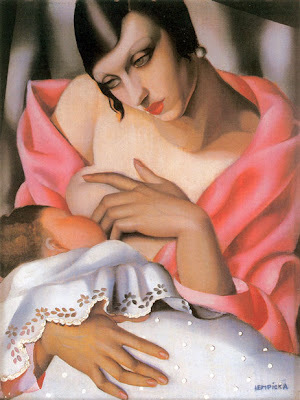 What a glamorous art-deco mother, by Tamara de Lempicka. And, last but not least (well, maybe), for your viewing enjoyment, I bring you a bearded lady from 1631 displaying her credentials. That was fun -- I think I'll have to do another roundup sometime. 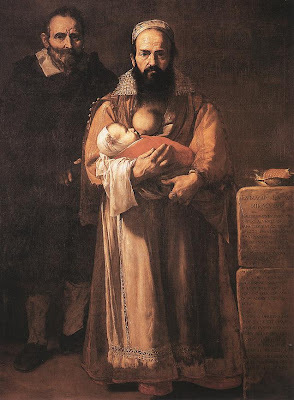 Here's someone else who's done a nice collection of 94 images of breastfeeding in art. If you'll look at the offerings there, you'll see that some countries use images of Mary breastfeeding on their holiday stamps. How about them apples, USPS? This is very cool, too -- a site where women sat with their nurslings in poses similar to those of famous paintings. 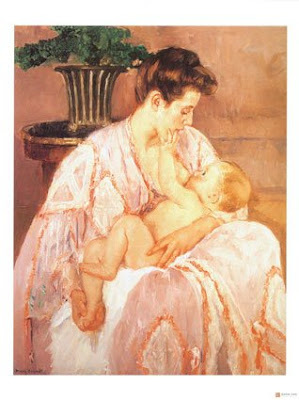 I hope all these inspire some of you mama artists to create your own breastfeeding art. I love seeing it portrayed beautifully and out in the open like this, not just in health pamphlets! Drink it in!